Earlier this year the foundation gave a group of young fellows $100k and two years of mentoring in exchange for quitting college. The experiment is still playing out. But they’re accepting applications for the next group. Here, the heads of the foundation make their case. To overworked high school seniors anxiously filing college applications, we have some good news. You don’t have to go. To 19-year-old college students ripe with talent we have even better news: You can leave. Your parents won’t tell you this, guidance counselors won’t tell you this, and university administrators, test prep companies, politicians, a nearly $1 trillion student loan industry, and other unscrupulous profiteers won’t tell you that you don’t have to go. They want you to believe that college is a guaranteed gateway to a successful career and that they’ll help you get there. But you already have what it takes to achieve great things and the price for what college offers–a wicked cocktail of debt, status, insurance, and consumption–is a scam. 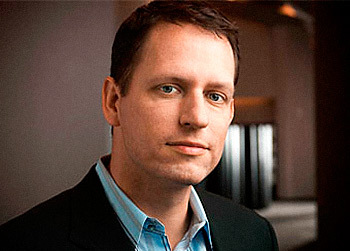 Last year, the Thiel Foundation (established by Peter Thiel, right) decided to start a revolution. We wanted to get smart kids out of the classroom and to the frontiers of knowledge quicker so they could start building America’s next great innovative companies. We created the 20 Under 20 Thiel Fellowship. We have 24 people under the age of twenty who have decided to skip college–before debt cripples their horizons–and start changing the world through entrepreneurship. In the first few months of their fellowship, they’ve already founded companies, raised capital, won prestigious awards, and put products on the market. We’re now taking applications for the second class of fellows. The deadline is December 31st. It’s easy to see how people have been lulled into bad choices. For a century, expanding wages made each generation wealthier than its parents, and it looked like having a college degree made the difference. But the future doesn’t look as good as the past. So-called high-debt borrowers graduate from private universities with an average debt of $53,200, and some with multiple degrees owe $200,000. Although the education bubble resembles the housing bubble in many ways, student loans can be much worse than mortgages–you can’t live in one. Interest piles on by nearly 7% a year, frequently even when you’re unemployed. And, while you can walk away from an unaffordable mortgage, in 2005 Congress made it illegal to walk away from a student loan, even if you declare bankruptcy. There’s no exit. In recent years, Sallie Mae has paid two of its executives hundreds of millions of dollars to reign over this mess. So with higher prices, deeper debt, and stagnant prospects, we have to ask, what are colleges good for? We know what they’re not good for. A recent study found that “After two years in college, 45% of students showed no significant gains in learning. After four years, 36% showed little change.” A year after college, a third of students are doing so well they move back in with their parents. Seventeen million Americans with college degrees have jobs that only require a high school degree. 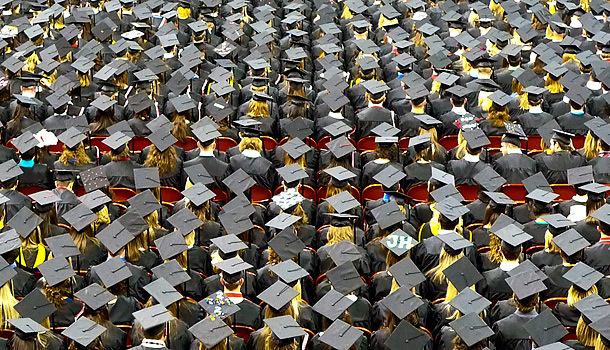 2.4 million more graduates are outright unemployed. There’s nothing wrong with being a bartender or cashier, but there is something wrong with a society that tricks 18-year-olds into ruining their lives with student debt through false promises of a positive return on their investment. If college is an insurance policy, then maybe it was issued by AIG. Over the last 30 years, both public and private colleges have more than doubled their prices, on top of inflation. Average student debt of graduating seniors gets worse by 6% a year. These increases have far outpaced consumer price inflation. They’re climbing even faster than health care. And taxpayers and generous alumni are paying, too. If you count all costs from rooms to research, private universities that grant PhDs spend an average of $63,700 per student every year. In case you were wondering, if a college degree is worth less than promised, or less than you paid, you can’t get a refund. But you can say no. You don’t have to play by these empty rules. You don’t have to take the bait. You can accept responsibility for your own education. You can change the world without it. Politicians and pundits debate what the government can do to end today’s economic stagnation. But a growing economy isn’t created by a political system. It’s created by passionate, innovative people who have ideas that just can’t wait. If you’re under 20 and match this description, join us at thielfellowship.org. Jim O’Neill is the head of the Thiel Foundation and co-founder of the 20 Under 20 program. Michael Gibson is the vice president of grants for the Thiel Foundation. Read about the experiences of the current crop of Thiel Fellows–in their own words–here.